Only 9 Outdoorsman models left in stock! Call 1-306-WATROUS, King of Trucks! No payments for 6 months O.A.C.This Ram 1500 boasts a Intercooled Turbo Diesel V-6 3.0 L/182 engine powering this Automatic transmission. WHEELS: 20 X 8 ALUMINUM -inc: Tires: P275/60R20 OWL AS, Bridgestone Brand Tires, Locking Lug Nuts, Full-Size Temporary Use Spare Tire, TRANSMISSION: 8-SPEED TORQUEFLITE AUTOMATIC (DFD) -inc: Active Grille Shutters, Electronic Shift, TRAILER TOW MIRRORS & BRAKE GROUP -inc: Exterior Mirrors w/Memory Settings, Electronic Trailer Brake Controller. 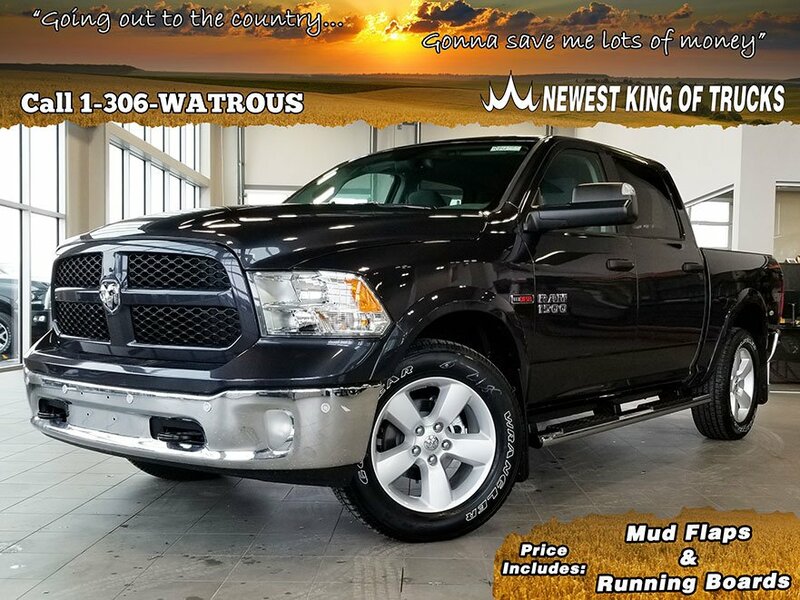 * This Ram 1500 Features the Following Options *QUICK ORDER PACKAGE 28T OUTDOORSMAN -inc: Engine: 3.0L EcoDiesel V6, Transmission: 8-Speed TorqueFlite Automatic (DFD), Rear Extra HD Shock Absorbers, Body Colour Grille, Accent Fender Flares, Black Door Handles, Outdoorsman Badging, Transfer Case Skid Plate, Front Suspension Skid Plate, Tow Hooks, Auto-Dimming Rearview Mirror, Painted Front Bumper, Painted Rear Bumper, Outdoorsman Group , TIRES: P275/60R20 OWL AS, SPRAY-IN BEDLINER, REAR WINDOW DEFROSTER, REAR CAMERA & PARK ASSIST GROUP -inc: Park-Sense Front/Rear Park Assist System, ParkView Rear Back-Up Camera, PARKVIEW REAR BACK-UP CAMERA, PARK-SENSE FRONT/REAR PARK ASSIST SYSTEM, MONOTONE PAINT APPLICATION W/OUTDOORSMAN -inc: Headlamp filler panels and door handles are black when ordering special paint (PX8, P68, P12, P61, P71, P18, PYB, P06, P64, PB8, P74, P72, P62, P81, P69, PL1, PGW, P73, P63), MONOTONE OUTDOORSMAN -inc: Bright Front & Rear Bumpers, MAXIMUM STEEL METALLIC. * Stop By Today *For a must-own Ram 1500 come see us at Mainline Chrysler Watrous, 9 Campbell Road, Watrous, SK S0K 4T0. Just minutes away!